1) That Einstein´s theories of relativity, and quantum mechanics, prove that relativism and subjectivism are valid points of views. 2) That Quantum mechanics and Einstein´s theories of relativity prove that classical physics (the age of enlightenment, rationalism) is not valid anymore. 1) That Einstein´s theories of relativity, and quantum mechanics, prove, that relativism and subjectivism are valid points of views. Subjectivism and relativism claim, that there doesn’t exist any objective truth, or reality. Truth, or reality, is something we create ourself, either as individuals or as cultures, and since there doesn’t exist any objective truth, there doesn´t exist any objective scale of truth. All truths are therefore equally true and equally valid, and if one person´s truth, or one culture´s truth, try to intervene in the truths of other individuals or cultures, then this is considered as an aggression. There both exists an individual version of relativism, and a collective version. The individual version is called subjectivism. This version is often connected with a right-wing liberalism. The other version is a collective relativism, cultural relativism, which often is connected to a left-wing socialism. However both are common in distorting both science and human rights. Both are demanding “alternative” views of science, and for example also human rights. And both are introducing intellectual apartheid in different ways. In the pseudoscience of reductionism you see both versions in the so-called heredity and environment arguments, where the right-wing version typical supports the heredity side, and the left-wing version supports the environment side (read more in my article The pseudoscience of reductionism and the problem of mind). In New Age pseudoscience it is not (yet) so much a political agenda that distorts science, but occult and religious point of views (read my article The pseudocience of New Age and reductionism). In the works of Fritjof Capra, though, you see the beginning of the combination. Fritjof Capra (born February 1, 1939) is an Austrian-born American physicist. He is a founding director of the Center for Ecoliteracy in Berkeley, California, and is on the faculty of Schumacher College. Capra is the author of several books, including The Tao of Physics (1975), and The Turning Point (1982). Quantum mysticism seems to have originated with Capra in his book The Tao of Physics: An Exploration of the Parallels Between Modern Physics and Eastern Mysticism. The book´s first two parts are excellent expositions on ancient religions and modern physics. The third part, which tries to connect the two is an abysmal failure. Nevertheless, it has been this third part, which has influenced numerous New Age advocates to claim that quantum mechanics proves the reality of everything from chi, prana, ESP, etc., etc., – to time travel. His other book, The Turning Point, shows the ideology in it, where he combines quantum mysticism with reductionism, especially reductionisms such as historism and sociologism (though he is very aware of the reductionism of the “old” mechanical worldview). The use of relativism and subjectivism in management theory (“it is not facts, but the best story, that wins!”), can be seen in a new trend within New Age: storytelling. This can be seen in New Age movies such as The Secret, What the Bleep Do We Know?, and The Living Matrix. In my article The New Thought movement and the law of Attraction I have examined The Secret. What the Bleep do We Know combines documentary-style interviews, computer-animated graphics, and a narrative that describes the spiritual connection between quantum physics and consciousness. The plot follows the story of a deaf photographer; as she encounters emotional and existential obstacles in her life, she comes to consider the idea that individual and group consciousness can influence the material world. Her experiences are offered by the filmmakers to illustrate the movie´s thesis about quantum physics and consciousness (you can read more about What the Bleep do We Know? in my article Constructivism: the postmodern intellectualism behind New Age and the self-help industry). The Living Matrix claims to bring breakthrough information that will transform your understanding of how to get well and stay well. Dynamic graphic-animation is woven with interviews with leading researchers and health practitioners as they share their discoveries on the miracle cures traditional medicine can´t explain. These experts reveal how energy and information fields – not genetics – drive human physiology and biochemistry, and illustrate the benefits of integrating conventional and alternative health care. What is introduced is the new paradigm in biology: Quantum biology. The producers of the above-mentioned films probably believe in their ideas, but, as mentioned, there is an even newer trend within New Age, where you fully conscious are creating a hoax. This is seen in the so-called WingMakers´ Project, which is a website, that has created a modern mythology; a synthesis of science fiction, ufology, parapsychology, quantum biology, theosophy and conspiration theory. It is created like if you were writing a science-fiction novel, or producing a science-fiction movie. The hoax consists in, that it claims to be a true story (see my article Time travel and the fascism of The WingMakers Project). Quantum biological theories (another version of quantum mysticism) are very popular for the time being within New Age, and are often (if not always) combined with fascistic ideas (besides the WingMakers Project, see my articles The Fascism of Theosophy, A critique of the Human Design System and The new feminism and the philosophy of women´s magazines). It is a sophistication to assert, that Einstein´s theories of relativity should imply, that there is no objective or true description of the physical reality. This is a confusion of physical relativity with epistemological relativism, which corresponds to a similar misunderstanding of quantum mechanics as subjectivistic. Quantum mechanics is not subjectivistic in the sense, that it is the human consciousness, which produces the phenomenons. It is not the consciousness of the physicist (the subjective), which makes the electron behave as a wave. It is the macrophysical (material) experimental devices, which affects the electron in such a way, so that you unambiguous know, that if you work with this type of apparatus, then the electron will always behave as a wave. In the same way the theories of relativity, epistemological seen, give no background for any relativism about, that ”everything is relative”. The seen does not depend of the eyes that watch when it comes to physical phenomenons, neither in quantum mechanics, nor in relativistic physics. But it is actually possible to use quantum mechanics to support both philosophical and spiritual point of views. The creator of quantum mechanics, Niels Bohr, is in his philosophy very inspired by Taoism. His coat of arms is showing the yin and yang symbol. The paradox is, that his philosophy/spirituality, which of course is grounded in quantum mechanics, directly pulls the carpet away under quantum mysticism. Quantum mechanics shows namely, that it is the order of nature that decides how we shall use our thoughts and language, it is not us that can create in reality as it fits us (see my article Quantum mechanics and the philosophy of Niels Bohr). This confusion in quantum mysticism (and in the New Age environment as such) arises because it is neither quantum mechanics, nor spirituality, that are the background for the theories, but the postmodern intellectualism, today especially represented by social constructivism (see my articles Constructivism: the postmodern intellectualism behind New Age and the self-help industry and The Sokal Hoax). This misunderstanding is especially based on an misunderstanding of Thomas Kuhn´s work The Structure of Scientific Revolutions, where he shows the development of physics – implemented in the concepts: normal science, anomalies, crisis, revolution and the creation of a new paradigm. I will explain Thomas Kuhn in relation with how he is abused in Neuro-linguistic Programming (see my article Neuro-linguistic Programming (NLP) and Large Group Awareness Training (LGAT)). NLP is founded by Richard Bandler and John Grinder. My memories about what we thought at the time of discovery (with respect to the classic code we developed – that is, the years 1973 through 1978) are that we were quite explicit that we were out to overthrow a paradigm and that, for example, I, for one, found it very useful to plan this campaign using in part as a guide the exellent work of Thomas Kuhn (The Structure of Scientific Revolutions) in which he detailed some of the conditions in the midst of paradigm shifts. For example, I believe it was very useful that neither one of us were qualified in the field we first went after – psychology and in particular, its therapeutic application; this being one of the conditions which Kuhn identified in his historical study of paradigm shifts. Who knows what Bandler was thinking? Kuhn did not promote the notion that not being particularly qualified in a scientific field is a significant condition for contributing to the development of a new paradigm in science. Furthermore, Kuhn did not provide a model or blueprint for creating paradigm shifts! His is an historical work, described what he believed to have occured in the history of science. He made no claim that anything similar happens in philosophy and he certainly did not imply that anything NLP did, or is doing, constitutes a paradigm shift. But the use of the concept of paradigm shifts is very popular in the postmodern intellectualism and its more common spiritual movement New Age, where a lot of different “spiritual” systems (new-thinking), often contradictory, are claiming, that it from now on is impossible to think in “old” ways anymore, without accepting their systems. The failure is due to their constructivistic ways of thinking; that is: subjectivism and relativism. The phrases old-thinking and new-thinking are also very popular within the so-called postmodern intellectualism, which is the background for what I consider as a wrong spiritual turn within the more popular, common movement of New Age. In this movement I for example have heard people refer to themselves as New Thought Ministers (see my articles Six common traits of New Age that distort spirituality and The New Thought movement and the law of attraction). The phrases old-thinking and new-thinking are often used as a weapon against critique, and I see them as a signal of the rising of a dangerous ideology. In lack of better - in our postmodern world - I have called this ideology The Matrix Conspiracy (see my article The Matrix Conspiracy). The name Newspeak is the name George Orwell gave the language, which the rulers in his dystopian novel 1984, had created. The intention with it was to control thinking, to make some ideas impossible to think, including concepts such as good and evil, true and false, beautiful and ugly. In this connection they used concepts such as old-thinking and new-thinking, so that people get a feeling of guilt, everytime they use concepts within old-thinking. Today, after having passed 1984, we live in a so-called postmodernistic dystopia, where eternal values such as goodness, truth and beauty fall more and more away – and where we have been invaded by the ideology of relativism, which rulers, in creeping ways, use the same phrases as the rulers in Orwell´s novel, as if they had used it as inspiration (the nearest to an attempt of actually creating a new language, which implies some rules about what is considered as “negative” and “positive”, is probably the creating of the so-called Giraffe-language – see my article Nonviolent Communication is an instrument of psychic terror). This new language accepts the use of thought distortions (see my book A dictionary of thought distortions) – as for example rhetoric, ad hominem move, sophistry. Therefore they demand alternative sciences (and alternative views of human rights), what I call the Illuminati-aspect of The Matrix Conspiracy, because science can´t be mixed with spiritual or political concepts. If this happens, then it is not science anymore. The same thing with relativistic and subjectivistic views of human rights; then it is not human rights anymore. Postmodern intellectualists are through this use of language often trying to get a political agenda forced through. If you change the political terms with spiritual terms, though, the same language is used in New Age circles. As an example is the famous American New Age guru Deepak Chopra, who has invented the concept of quantum healing, which again is based on the misunderstanding of quantum mechanics, that the mind can control everything. Chopra is without hesitation going into discussions with experts, and is precisely using the above-mentioned language. On ABC's Nightline Deepak Chopra entered a week-long debate against arch atheist Dr. Michael Shermer. The debate was organized as a part of Nightline's "Face Off" event series, and was incited by a public challenge issued by Chopra. Joined by religious scholar Dr. Jean Houston and neuroscientist Sam Harris, the group gathered at the California Institute of Technology to settle a long-time argument regarding the ultimate question: Does God have a future? The debate was heated from the get-go, with Chopra issuing a rousing appeal to his audience of scientists and students: "One of the things we have to do is stop being the Jihadists and Vatican of conservative, orthodox science, which is not relevant anymore." Shermer snapped back by claiming that Chopra's opening remarks were "the very embodiment of woo woo," a term Shermer uses to describe what he considers dangerous pseudoscience. Initially, the debate centered around accusations of misrepresenting contemporary theories of quantum physics to serve either religious or atheistic ends. Harris criticized Deepak's identification of God/Nature as "infinite potentiality," calling his interpretation "unprincipled." Chopra made the claim that Harris' conception of science was dogmatic and closed off to alternative interpretations. In the final days, the debate gravitated around whether spiritual experiences should be explained in material or immaterial terms. Eventually, the debaters could not agree on the issue of whether such experiences originate within the body or outside of it. The emergence of quantum mechanics has not made classical physics invalid; it is still valid, but Planck´s constant (the quantum postulate) has given it a limited scope of application. According to Niels Bohr quantum mechanics is a generalization of classical physics, and the complementarity principle is a generalization of the classical causality principle. In the same way the theory of relativity is a generalization in another direction of the classical physics. According to Bohr you can´t replace classical physics with quantum physics, because the validity of classical physics is a necessary precondition for, that you can describe the quantum mechanical phenomena, and set out for the macroscopical (“classical”) experimental arrangement. This means, that both materialism and idealism (subjectivism and relativism) are invalid point of views. On the one side quantum mechanics breaks with the principle of causation and determinism, so that neither the human brain/thought, or nature and evolution, can said to be fully cause-determined systems, as materialism claims. On the other side you can´t say neither, that the principle of causation and determinism are invalid, as idealism (subjectivism and relativism) claims. They are still valid, but with a limited scope of application. Instead you must use the complementarity-principle. An interesting thing is, that almost all New Age versions of quantum mysticism, which totally deny the validity of the principle of causation and determinism (law of attraction, quantum healing, time travel, etc., etc.) actually are based on extreme cause-determined theories, for example the law of attraction, which claims, that if you think in a certain way, then the universe will reward you in a certain way. 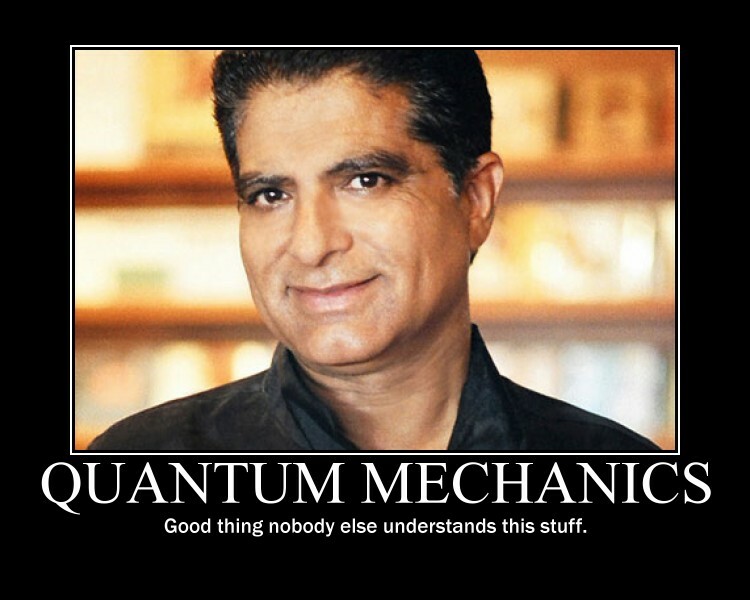 But that is what quantum mechanics breaks with. If you want a deeper going examination of quantum mechanics, read my article Quantum mechanics and the philosophy of Niels Bohr.